Every fair-minded person knew it all along but Sadc helped drill the point into recalcitrant opposition heads at the weekend when the regional body declared that President Mnangagwa's legitimacy is unquestionable. This is not a point that we needed to make really for making it suggests an element of doubt but we have to make it once again for the benefit of the MDC Alliance which has, since August, been unashamedly questioning the presidential election result that showed that its leader, Mr Nelson Chamisa lost to President Mnangagwa. On August 3, the Zimbabwe Electoral Commission (Zec), an independent constitutional body, declared the President the winner of the presidential election after he polled 2 460 463 votes, against Mr Chamisa's 2 147 436. The opposition politician rejected the outcome and petitioned the Constitutional Court seeking an order for the result as announced by Zec to be overturned. His petition was devoid of any proof of vote rigging, only presenting a mathematical model whose accuracy and reliability any court would not vouch for. The apex court declared, on August 24, President Mnangagwa duly elected in terms of the laws of the country. The judgment meant that he had secured legitimacy at two levels, first in terms of the popular will of the Zimbabwean electorate whose results were announced by Zec and second, in terms of the decision of the highest court in the land. In addition to that, a range of observer missions to the July 30 elections, among them Sadc and the African Union, had come to the same conclusion. Therefore, the President's legitimacy was evidently unquestionable since then, but all this does not prevent opposition naysayers from continuing to question the unquestionable. 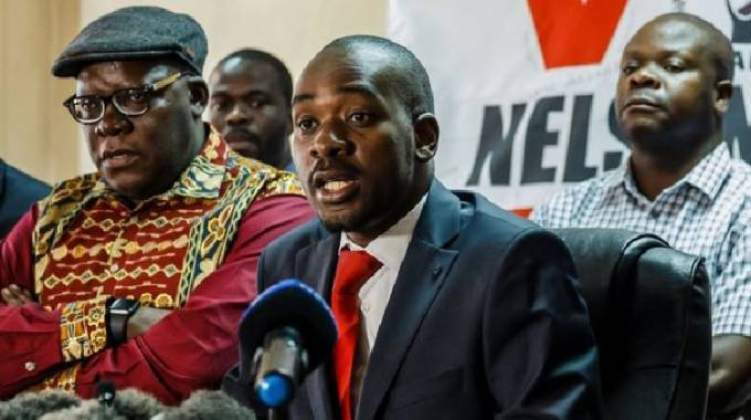 Mr Chamisa made remarks to that effect at his protest march in Harare last week adding that he had sent a petition on the same to Sadc and African Union. This has been the basis of his demand for dialogue that he said will result in the formation of what he terms a "transitional authority" to return the country to "legitimacy." Sadc Executive Secretary Dr Stergomena Lawrence Tax, visiting the country last week, told The Sunday Mail that President Mnangagwa is in office legitimately and that her office was actually laying the groundwork that will see him assuming the chairpersonship of the influential Organ on Politics, Defence and Security Co-operation sometime next year. "In terms of the petition, I have not received the petition," she said. "What should be recognised is that Zimbabwe is a sovereign country, Zimbabwe has a Constitution and Zimbabwe is guided by a number of legislation. Our advice is that let those be observed, elections took place, elections were contested, the Constitutional Court also judged. So all those were processes and instruments to ensure that there is democracy." Earlier, Chief Emeka Anyaoku, a member of the Motlanthe Commission that is investigating the circumstances surrounding the August 1 violence that left six people dead and valuable property destroyed in Harare, had asserted the President's legitimacy. He told Mr Chamisa when the opposition leader appeared before the commission last week that the presidential election result was valid having been declared by Zec and endorsed by the top court. Also last week, the Deputy Chief Secretary to the President and Cabinet, Mr George Charamba, who is the Presidential spokesman too, told a private paper that President Mnangagwa was open to dialogue with Mr Chamisa, but the opposition leader must first accept that the President was democratically elected. Indeed this point that Mr Charamba made is fundamental as a starting point for any dialogue between the President and the opposition, which, in our view must not be limited to MDC Alliance only but other parties that are in much the same position as the coalition. Sadc's position on the legitimacy of the Government, while well known and obvious before The Sunday Mail interview, is important in a few respects. It fatally weakens Mr Chamisa's voice in his persistent calls for dialogue with Zanu-PF and his continued rejection of the election results that everyone who matters has already certified as inviolable. He is attempting to make the election issue the pivot of his calls for dialogue, but if it is only he who believes there is a legitimacy question to address, he is on a road to nowhere. At another level, Sadc's position means that the petition that Mr Chamisa claims to have sent to the regional bloc is a waste of time. There is no possibility that Sadc would even begin to read the petition, if any exists, having already made its position on Zimbabwe clear. Dr Tax's remark that she had not seen the so-called petition is enough to demonstrate her office and the region's attitude towards Mr Chamisa's antics.